Wednesday morning, the second day of a conference that gathered hundreds of Michigan education officials in Detroit, began with a 6:30 a.m. workshop that taught women who manage school budgets how to dish out an open-handed slap. Yes, school finance officials are learning self-defense. Call it a sign of the times. 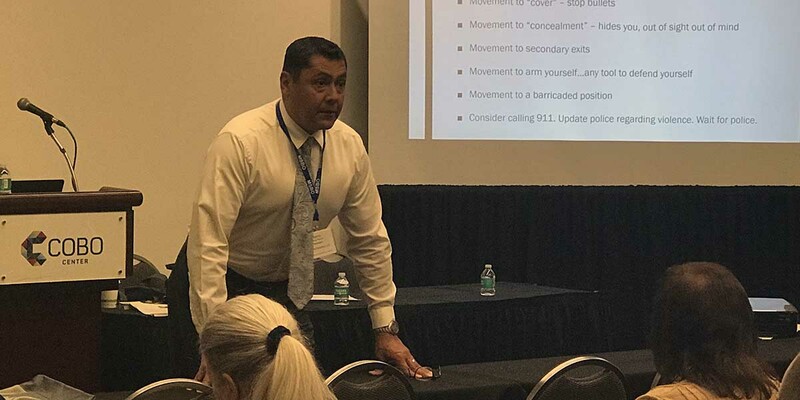 The workshop was one of 200 sessions in the Michigan School Business Officials’ annual conference this week that brought 1,400 members to Cobo Center on Detroit’s downtown riverfront. The conference, which concludes Thursday, was heavy on finance but also timely issues such as school shootings, the statewide teacher shortage and the rising costs of pensions. Bridge Magazine’s parent organization, The Center for Michigan, also presented “Politics and Education in Michigan: 2018 Election Edition,” an interactive discussion sharing data on the state’s most pressing education issues, along with tools for engaging communities throughout the state on the major issues of the 2018 election cycle. The conference was the latest stop in the Center For Michigan’s Truth Tour, a traveling newsroom that will engage residents statewide on critical issues during the 2018 election cycle. More than 100 stops are planned throughout the state in an effort to increase citizen engagement in the political process. At each stop, the Center for Michigan and Bridge are asking residents about their deepest political and public policy concerns. Henry Reyna, a former police officer in Saginaw Township, showed the school officials parts of a video in which a man shot up a school board meeting in Panama City, Florida in 2010. In the video, a woman pops out of a door and tries to attack the gunman. He batted her away while board members sat in their seats, frozen in fear. The gunman didn’t injure anyone with the bullets before he took his own life. But the video showed that it’s important for staff and students to be trained in self-defense and threat response, said Reyna, a security consultant who has trained people in groups from Girl Scout troops to private schools and businesses. Staff and students should also be trained how to barricade doors, Reyna said. The ongoing negotiation in Lansing over next year’s budget is probably the most important legislative issue related to schools now as everyone waits to see if schools will get more funding. But another crucial financial topic that went to the Senate Education Committee this week deals with the teacher shortage, said Christopher Glass, director of legislative affairs for West Michigan Talent Triangle, a collaboration of education and business officials in Kent, Muskegon and Ottawa counties that advocates for education policy. Michigan had about 91,000 teachers in 2017, down from 103,000 in 2005, a white paper released last fall by the Michigan Department of Education shows. Senate Bill 947, would allow retired teachers to come back - without losing their pensions - and teach subjects or take on positions where schools have a “critical shortage.” The current law expires July 1, but the bill would extend the law until 2021. The number of school districts that have a deficit is going down. That’s good. But the concern among every school district is that school costs such as utilities and healthcare are going up but current Michigan school funding remains below 2009 levels when adjusted for inflation, said Donald Sovey, President and CEO of School and Municipal Advisory Services, a Charlotte-based consultant who works with districts in or near deficit. At the end of the 2017 school year, only 19 school districts were in a deficit, down from more more than twice that number five years prior. But too many of the state’s 550 school districts have less than 10 percent of their budget amount in reserves, or savings. On average, school districts in Michigan have an 11.8 percent fund balance - or savings - in their general funds, state data show. The MSBO suggests 15 to 20 percent as a healthy fund balance. Avoiding deficit, building a cash reserve and funding needed curriculum improvements all at the same time is every district’s battle, Sovey said. “This is hard work and it’s important work,” he said. "The Times, Places and Manner of holding Elections for Senators and Representatives, shall be prescribed in each State by the Legislature thereof;"
Someone will draw lines and these lines will be partisan, and it may as well be drawn by those constitutionally constituted and let them screw the opposition. Rising pension costs seem to be the elephant in every room. Why not take a look at how the private sector is doing this and take a page from their book, change the system from defined benefit to defined contribution. I know that past performance is no guarantee of future results, but it is a good indicator. Having the privilege of hindsight, I looked at my own situation, did the math, and found that if I had invested my and my employer pension contributions, I would have approximately 2 1/2 times the take home that I was receiving from my pension. Given the opportunity to sell my pension back to my employer a few years back, I, along with about 40% of my co-workers, gladly took it and rolled it over into my qualified retirement savings. Doing that, I enjoyed tremendous tax advantages as well as having the peace of mind of having control over all my assets. Granted, the risk is all mine now, but anyone that believes every dollar of a pension is guaranteed need only look at the books of the Pension Benefit Guarantee Corporation (PBGC) to learn that there are no guarantees in life. For schools to not have the burden of pension plan payments every year, they should seriously look at changing to a defined contribution system. "Michigan had about 91,000 teachers in 2017, down from 103,000 in 2005, a white paper released last fall by the Michigan Department of Education shows. Senate Bill 947, would allow retired teachers to come back - without losing their pensions - and teach subjects or take on positions where schools have a “critical shortage.” The current law expires July 1, but the bill would extend the law until 2021." Let this retired Math teacher be clear. I am NOT coming back!!! Nor this ole English teacher, Bob. Unless you really needed the money or missed the job terribly I can't imagine many teachers being interested in going back to work. I was lied to. We were promised that students would be safer once we made it illegal for honest adults to carry guns on, or near, a school campus. Well that promise sure didn’t work. The US Department of Justice reports that almost all the active shooter incidents took place in “gun-free” zones. A quarter of those incidents took place in our schools.